Fresh Goji berries on the vine. For more than 600 years, the people of Ningxia have cultivated goji berry plants in their region’s deep windblown loess soil. Practitioners of traditional Chinese medicine who wanted to use all parts of the plant fed a growing demand for this nutrient-dense “superfood.” Today, the plant’s berries as well as its flower, stem, root and leaf are still used to treat a variety of ailments. 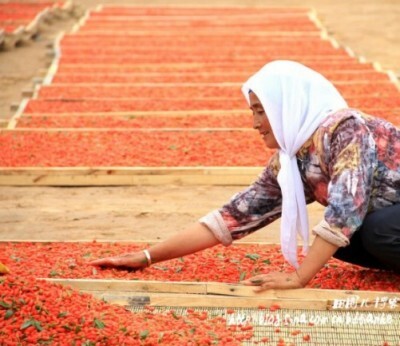 Despite goji berry cultivation springing up in other parts of the country, Ningxia remains China’s important source for therapeutic-grade goji berries that can be used in medicine. Goji berries drying near the fields of goji in Ningxia. Although the harsh, arid climate of Ningxia is essentially a desert, the Yellow River (Huang He) provides goji berry plants with essential moisture. Throughout hundreds of years of cultivation, a complex system of irrigation canals has also been developed to nourish the region’s most renowned export. With added water, the 300-foot deep loess of the Ningxia Plain becomes fertile enough to produce some of the highest quality goji berries in the world. Historically, Ningxia was home to some of Imperial China’s first agricultural outposts. Over the centuries, farmers settled in the region and the Silk Road that passed through brought a profusion of commercial and cultural exchanges. Primarily populated by Han Chinese, Ningxia also has a large community of Chinese speaking Muslims called the Hui. For centuries, the Ningxia region was protected from invaders by a section of the Great Wall of China. 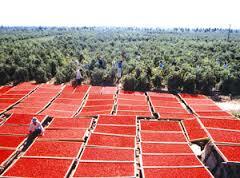 The Ningxia goji berries that we use to produce Chicaoji are raw and organic. Although we love to add the sweet, tart flavor of goji berries to our chipotle sauce, these healing fruits can also be eaten by themselves, added to a delicious trail mix or blended into health tonics. 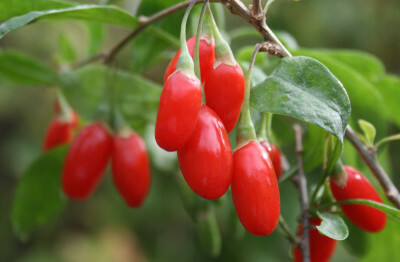 Take a look at our Goji Berry page to learn more about this amazing superfood. I hope you’ve found something interesting and useful in this post. Food is medicine. Therefore, I live.